Which of these mega-cap stocks is the best buy now? With market caps of $850 billion and $720 billion, respectively, Apple (NASDAQ:AAPL) and Google parent Alphabet (NASDAQ:GOOGL) (NASDAQ:GOOG) posses a level of size and scale that only a handful of businesses in the world can claim. And as they've ascended to dominance, they've earned a fortune for their investors along the way. Apple and Alphabet are two of the biggest beasts in the public markets. We put them head-to-head to see which is the best investment from this point forward. Image source: Getty Images. Alphabet and Apple are both powerhouse businesses, but let's take a look at some key metrics to see how they stack up in regard to financial strength. With nearly $24 billion in annual free cash flow and $105 billion in net cash on its fortress-like balance sheet, Alphabet's financials are a thing of beauty. Yet incredibly, Apple's cash-generating ability is even more impressive. The tech colossus produced more than $52 billion in free cash flow over the past year, and its net cash position exceeds $162 billion. So although Alphabet is one of the most financially sound businesses in the world today, Apple's cash production and balance sheet strength are simply unparalleled. Apple may be the more financially powerful business, but Alphabet has enjoyed significantly higher revenue, operating income, and operating cash flow growth in recent years. Wall Street expects this trend to continue. 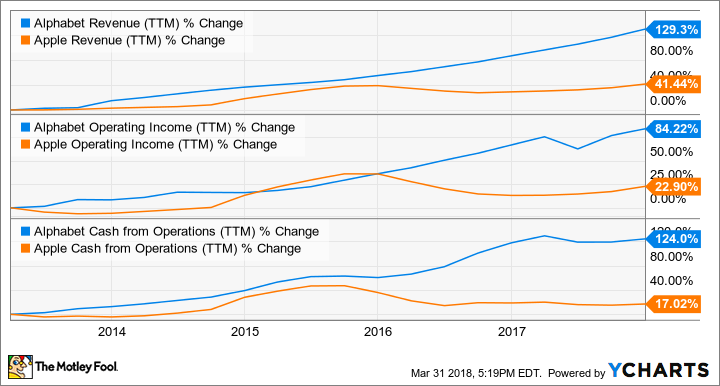 Analysts are forecasting Apple's earnings per share (EPS) to rise by about 13% annually over the next half-decade, driven by the growth of its services business and "other products" segment, along with its massive share repurchases. Alphabet, however, is projected to increase its EPS by more than 24% annually during this same time, fueled by continued growth in its core search business and YouTube, as well as its aggressive push into cloud computing. So in terms of both recent past and expected future earnings growth, Alphabet is the clear leader. No better-buy discussion should take place without a look at valuation. Let's now check out some key value metrics for these tech titans, including price-to-free-cash-flow, price-to-earnings, and price-to-earnings-to-growth ratios. Apple's shares are considerably less expensive on both a P/FCF and forward P/E basis. And while Alphabet's stock is slightly less expensive on a PEG ratio basis -- which factors in its higher expected EPS growth rate -- it's not enough for me to give the edge over Apple here. Apple and Alphabet are both excellent businesses that are likely to continue to deliver strong returns to investors in the years ahead. But Apple's incredible cash-generating ability and more attractively priced stock make it the better buy today.